SYMVIONICS COMPLETES NAVY SHOREBASED RADAR AIR TRAFFIC CONTROL (ATC) TRAINING SYSTEM (SATS) BLOCK UPGRADE PROGRAM - SYMVIONICS, Inc.
As a prime contractor to the Naval Air Warfare Center Training Systems Division (NAWCTSD), SYMVIONICS recently completed the upgrade of Device 15G31 (SATS) Radar Laboratory 2 and Radar Laboratory 3 training devices located at the Naval Air Technical Training Center (NATTC), Pensacola, Florida (FL). This contact was awarded under the NAWCTSD Training System Contract (TSC) III Multiple Award Contract (MAC). 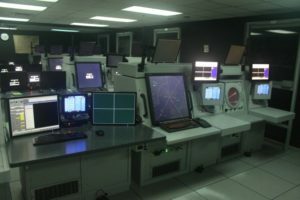 This was SYMVIONICS’ seventh contract dealing with the upgrade of the Navy’s ATC Trainers at NATTC. 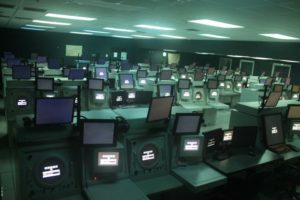 Device 15G31, Radar Lab 2 consists of an Instructor Operator Station (IOS), 15 simulated Standard Terminal Automation Replacement System (STARS) radar consoles, and related support equipment. Device 15G31 Radar Lab 3 consists of nine mini-labs. Each mini-lab has one IOS, one STARS radar console, three Precision Approach Radar (PAR) consoles, and related support equipment. Radar Labs 2 and 3 are used in the ATC “A” School to teach the fundamentals of basic radar ATC procedures. Updates completed by SYMVIONICS includes: Standard Terminal Automation Replacement System (STARS) upgrades and modifications, Visual Indicator Display System (VIDS) upgrades and modifications, Speech Recognition System replacement, speech channel capability upgrades, voices used for the pilot response system, aircraft targets and scenario updates, Scenario Development System modifications, IOS target control upgrades, IOS Tactical Situation Display (TSD) upgrades, and Precision Approach Radar (PAR) upgrades. All upgrades were accomplished on-time and on-schedule, and met all specifications and contract requirements with exceptional quality and capability.